The world’s number one liquorice, smothered in Darrell Lea’s finest Traditional Milk Chocolate, it’s a favourite for everyone. Milk Chocolate contains Cocoa Solids minimum 31% and Milk Solids minimum 24%. 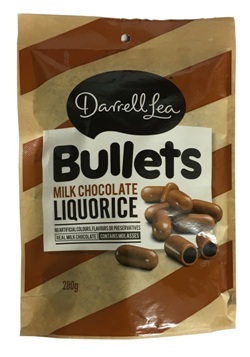 Darrell Lea milk chocolate bullets are superb. At first you might think that chocolate and licorice would simply not mix but the combination really works. I enjoy these so much that I buy 5 bags at a time. I first bought these on holiday in Australia. I think it is great that sanza stock these and a huge range of other ozzy products. I love these, it's a perfect combination of chocolate and liquorice, surprisingly good mix.